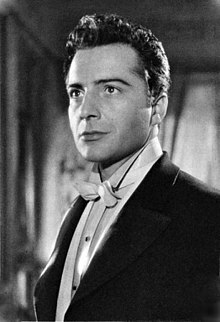 Rossano Brazzi (18 September 1916 – 24 December 1994) was an Italian actor. Brazzi was born in Bologna, Italy, the son of Maria Ghedini and Adelmo Brazzi, an employee of the Rizzoli shoe factory. He was named after Rossano Veneto, where his father was stationed during his military service in World War I. Brazzi attended San Marco University in Florence, Italy, where he was raised from the age of four. He made his film debut in 1939. He was propelled to international fame with his role in the English-language film Three Coins in the Fountain (1954), followed by the leading male role in David Lean's Summertime (1955), opposite Katharine Hepburn. In 1958, he played the lead as Frenchman Emile De Becque in the Rodgers and Hammerstein musical South Pacific. His other notable English-language films include The Barefoot Contessa (1954), The Story of Esther Costello (1957), opposite Joan Crawford, Count Your Blessings (1959),The Light in the Piazza (1962), and The Italian Job (1969). In 1940, Brazzi married baroness Lidia Bertolini (1921–1981) to whom he was married until her death from liver cancer in 1981. The couple had no children. However, he did father a son, George Llewellyn Brady (born 24 July 1955), from a relationship with 20-year-old Llewella Humphreys (1934–1992), the daughter of American mobster Murray Humphreys. Llewella Humphreys later changed her name to Luella Brady, an anglicization of Brazzi. In 1984, Rossano Brazzi married Ilse Fischer, a German national, who had been the couple's housekeeper for many years. Originally from Düsseldorf, Fischer had met Brazzi as an infatuated fan in Rome at the age of twenty-four. This marriage was also childless. Brazzi died in Rome on Christmas Eve 1994, aged 78, from a neural virus. ^ a b c "Rossano Brazzi, Actor, 78; Romantic Leading Man of Films". The New York Times. 27 December 1994. Retrieved 1 April 2014. ^ "Rossano Brazzi Profile". Turner Classic Movies. Retrieved 18 March 2017. ^ Rossano Brazzi: Portrait of a "Gentleman of the Cinema"
Wikimedia Commons has media related to Rossano Brazzi.